Both Carlos Rodon and Yoan Moncada struggled last year with the White Sox. But their solid starts to the season are encouraging signs that both players can live up to their hype in 2019. One of the joys of early season baseball is the hope that one good start or day at the plate engenders. It’s different than a strong performance in June or July in that it represents a huge portion of that player’s season to date. In the case of a pitcher, it may make up 100% or 50% of his year thus far. And that’s why in the middle of last week, I was compelled to share this on Twitter. Carlos Rodon: It might be happening. Four years after Rodon made his MLB debut, and five years he was the third overall pick in the amateur draft, it really might be happening for him. He has made two starts this season, allowing two earned runs on five hits and two walks, while striking out 15 batters in 11 1/3 innings. That translates to a 1.59 ERA, 0.62 WHIP, with a 32.6% strikeout rate and 4.3% walk rate. There’s reason for April excitement with Rodon. I sent that tweet during his second start of the year, a dominant performance in a win over the Indians. Rodon went six innings in that game, allowing one unearned run on two hits and a walk, fanning nine batters. He got 16 whiffs on 103 pitches, a swinging-strike rate of 15.5%. Combine that with his first outing of the season, and Rodon has an 11.8% whiff rate. While it’s too early to be excited about that specific number, it’s worth noting that Rodon has never had a whiff rate better than 10.3% for a full season in his career. What’s more, the way Rodon is getting his whiffs suggests we’re watching a changed pitcher. Rodon has made two major changes to his pitch usage this season. First, he has completely eliminated the two-seam fastball from his repertoire. He cut back on it significantly last year, slashing its previous usage by about half to 10.6%. Heading into this season, about 22% of the pitches Rodon threw in his career were two-seamers. He has yet to offer one this year among his 204 pitches thrown. With the two-seamer out of the mix, Rodon is throwing more sliders. A lot more sliders. Last year, his usage rate on the slider was 26.1%, right in line with his career norms. Through two starts this year, he has thrown his slider 40.2% of the time. The pitch has a whiff rate of 23.2%, but also a called strike rate of 17.1%. As you can see from this pitch chart for the slider, courtesy of Baseball Savant, it’s not simply a chase slider. Rodon is commanding it for a strike, mostly down in the zone and to both sides of the plate. Let’s take a look at Rodon getting whiffs with the slider, one against a righty and one against a lefty. 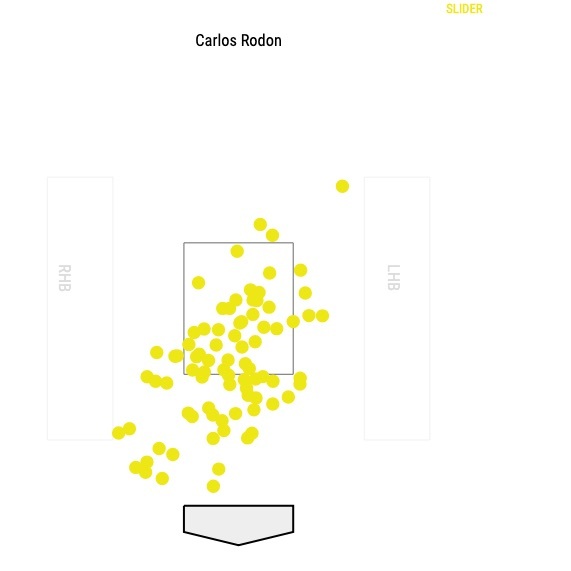 Rodon’s slider does have some loopiness to it, but pay special attention to the whiff he got against lefty Leonys Martin. His slider can get more straight-down break than your typical slider, and that makes it unique in that it’s harder to read out of his hand. That’s what helps make it so good to hitters from either side of the plate. Now let’s take a look at Rodon using the slider in the zone to get ahead. The following GIFs show consecutive pitches against Carlos Santana. The first one has a bit of a get-me-over feel, but it’s still spotted well on the outside corner. Chances are good that Santana, a famously patient hitter, isn’t going to offer at that, especially as the first pitch in a plate appearance with runners on the corners. The second one, however, is particularly filthy. It’s to the opposite side of the plate and stays in the zone, locking up Santana for strike two. Commanding the slider in the zone to both sides of the plate could be the key to unlocking Rodon’s vast potential. Too often in the past, he leaned on the slider as a chase pitch, and didn’t have enough to get hitters out when they laid off. If he’s forcing them to swing at sliders in the zone, he can get them to chase it out of the zone more often, while also making his 91-93 mph four-seamer appear faster than it is. It really might be happening. And now, onto the rest of the Table Setter for the week of April 8. Kluber opposed Rodon in his great outing against the Indians and didn’t fare nearly as well, allowing four earned runs on eight hits and three walks in 3 1/3 innings. What’s been most troubling for Kluber this season is the lack of strikeouts and diminished velocity. The former Cy Young winner has nine strikeouts in 10 1/3 innings, and his average four-seamer is down to 91.9 mph. He was excellent last year, but his strikeout rate fell to 26.4%, a dip of eight percentage points from the previous season. Through his first two starts this year, his strikeout rate is 18.8%. Mikolas has struggled thus far this season, allowing eight runs on 12 hits in 10 innings. He was one of last year’s brightest surprises, finding success by owning the strike zone and limiting hard contact. Both of those traits have eluded him this season. He’s already allowed four homers and walked three batters. The latter may not seem like a huge deal, but he didn’t issue his third walk until his seventh start last season. Mikolas’ stuff doesn’t leave him much room for error, and that has shown up in both of his starts this year. Fried shut down the Cubs in his first start of 2019, taking a perfect game into the sixth inning and allowing just one hit, a single by Mark Zagunis. Kevin Gausman returned from the DL on Friday, and Mike Foltynewicz likely isn’t far behind, and that means Fried will likely be back in the bullpen sooner rather than later. Still, the 25-year-old likely isn’t done making starts for Atlanta this season, and he could certainly force Brian Snitker’s hand with a couple more strong outings. Lucchesi is off to an excellent start this year, allowing seven hits and zero runs with 13 strikeouts in 10 1/3 innings. He remains a sinker-curveball specialist, but he has started mixing in a four-seamer to the tune of an 8.3% usage rate this year. Last year, he threw it less than 1% of the time. That’s something to monitor over his next few starts. Carlos Rodon isn’t the only pitcher who looks like he may have turned a corner early on this season. Castillo has been great, allowing two runs on three hits with 17 strikeouts in 12 2/3 innings. The seven walks are a bit of an issue, but that ace stuff has been on display in both of his outings this year. His fastballs are still sitting in the mid-90s and he has shown an improved changeup, which has a whiff rate of 37.3% thus far. In raw numbers, Castillo has thrown the change 59 times, second most among all the pitches in his repertoire, and induced 22 empty swings. That pitch could elevate him this season. Walker will get a long look at first base with Jake Lamb on the IL because of a calf strain. He's 7-for-26 with three homers and two doubles on the season, and is typically hitting fifth in Arizona's order. Walker hit .309/.382/.597 with 32 homers, 34 doubles and 114 RBI with Reno in 2017, earning a cup of coffee with the big league club in September. He was just as good last year, slashing .299/.354/.568 with 18 homers, 25 doubles and 71 RBI in just 84 games, while logging 53 plate appearances with the Diamondbacks. Remember that great tweet I fired off about Carlos Rodon? I replied to myself, like all the cool kids do, with this tweet a little later while watching that same game. Yoan Moncada: It’s definitely happening. Moncada is off to a blazing start, going 11-for-29 with two homers, four doubles and 10 RBI in 32 plate appearances. What's more, he has fanned just six times in his 32 trips to the plate. That's huge for a guy who struck out a league-leading 217 times last year. The former top prospect is showing why he was worthy of being the centerpiece of the deal that sent Chris Sale to the Red Sox. Barnes has been a big part of the Dodgers’ homer barrage to start the season, leaving the yard two times in 21 plate appearances. It’s a shame that he can’t break into the lineup at second base because he’ll probably be limited to four starts per week behind the dish, but that’s still plenty of opportunity to make him a worthy starter in fantasy leagues. Ramirez left Cleveland’s game on Thursday after fouling a ball off his left foot, but it didn't cost him any meaningful time. He did take a rest on Friday, but pinch hit in that game, drawing a walk and swiping a base. Ramirez was back int he starting lineup on Saturday, going 2-for-5 with a pair of steals. The fact that he has run so much in the immediate aftermath of his foot injury is a great sign that it isn't an issue. It seems easy to forget that Swanson is just 25 years old because he made his debut in 2016, has played two full years in the majors and has fallen well short of expectations to this point of his career. Yet, he’s still very early in his lifecycle as a major leaguer, and the pedigree that made him the No. 1 overall pick in the 2015 amateur draft didn’t fade away. Swanson is swinging a hot bat to start this season, hitting .318/.467/.636 with two homers, seven RBI and six walks against five strikeouts in 30 plate appearances.